This is a colorless gourd-shape flask decorated with gadrooning on the bottom and a raspberry prunt centered on each side. A similar glass vessel is in the Batchelor collection at The Fitzwilliam Museum in Cambridge and was on display from December 2018 to March 3, 2019. 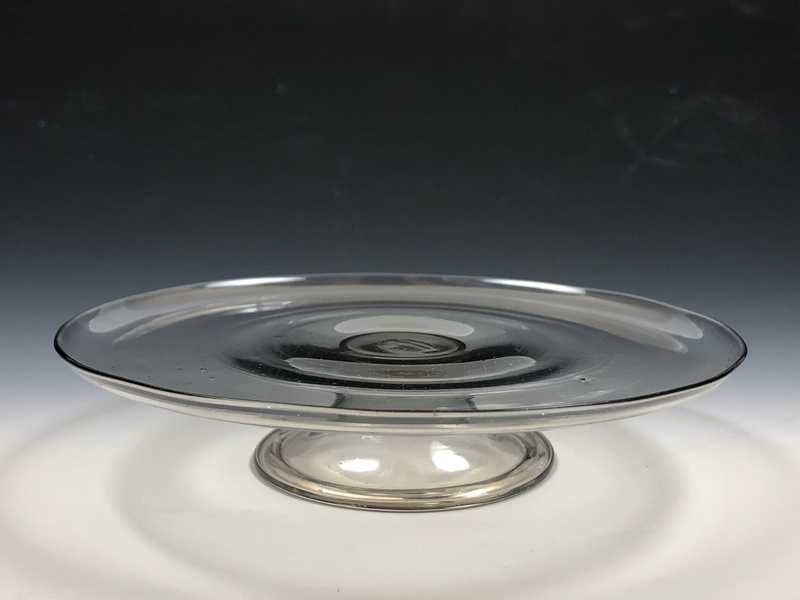 A small tazza made of clear soda glass with a shallow tray gently curving up at the edge. The spreading conical base has a folded foot. 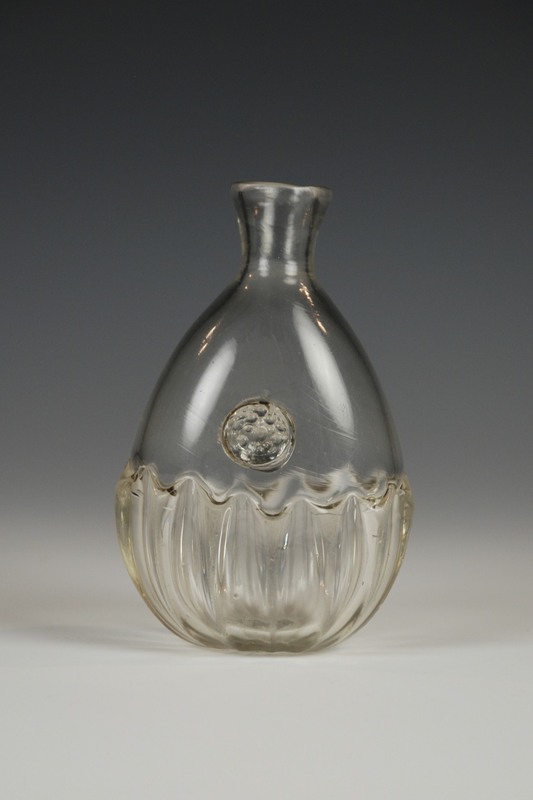 This is a product of one of the Duke of Buckingham’s glass factories in England which were active around the 1670’s. The tazza illustrates the influence of Venetian style of glassmaking and use of soda glass prior to the introduction of leaded glass later in the British market of the 18th Century. 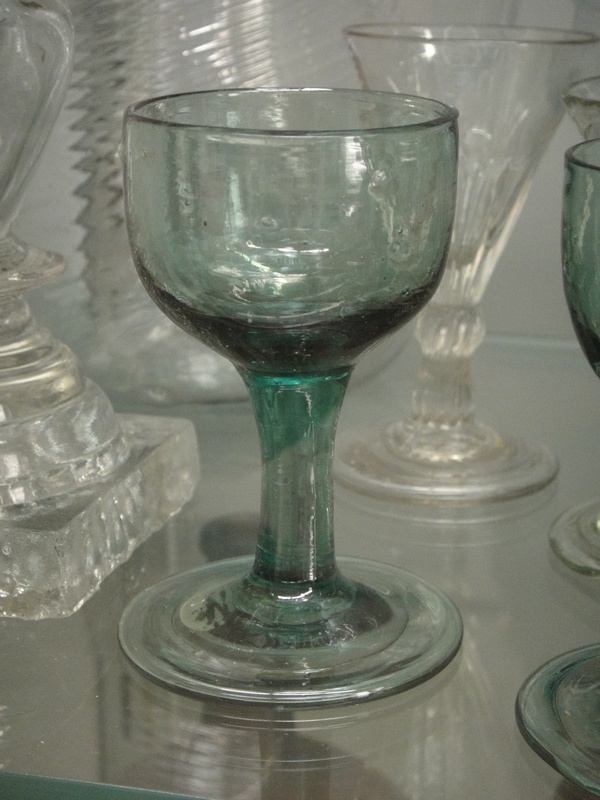 This wineglass is blown from brilliant light green lead glass. It has a circular bowl with heavy tapering cylindrical stem drawn from same gather to a broad circular foot with an in-folded rim. The wine could be American or English. This is an Arts & Crafts small spirit carafe. It is made of fine leaded glass in a clean and pleasing shape. 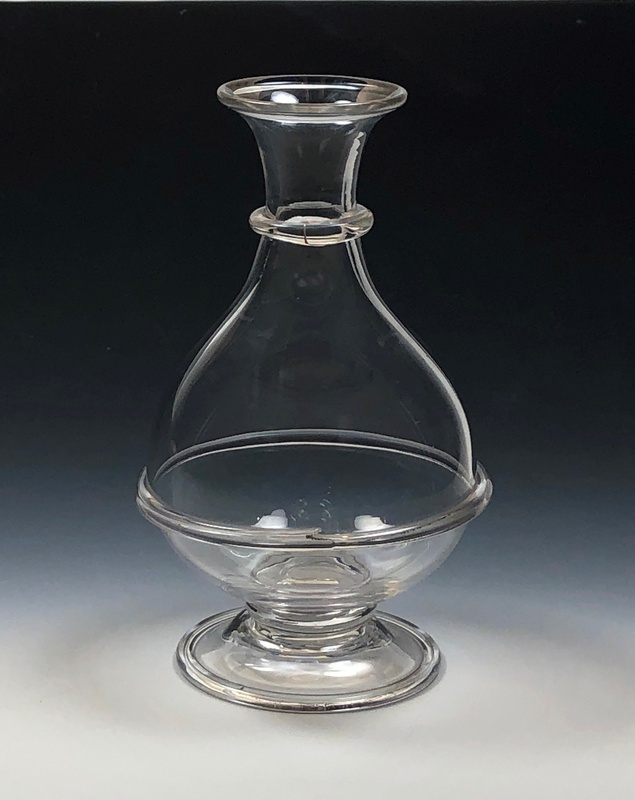 The carafe was made by Powell & Sons (Whitefriars) Ltd in, England. In 1834 James Powell (1774–1840), purchased the Whitefriars Glass Company, a small glassworks off Fleet Street in London, believed to have been established in 1680. The company, mainly known for manufacturing stained glass windows, provided glass to other stained glass firms and a wide range of other handmade glassware. The Whitefriars Co. closed in 1980. 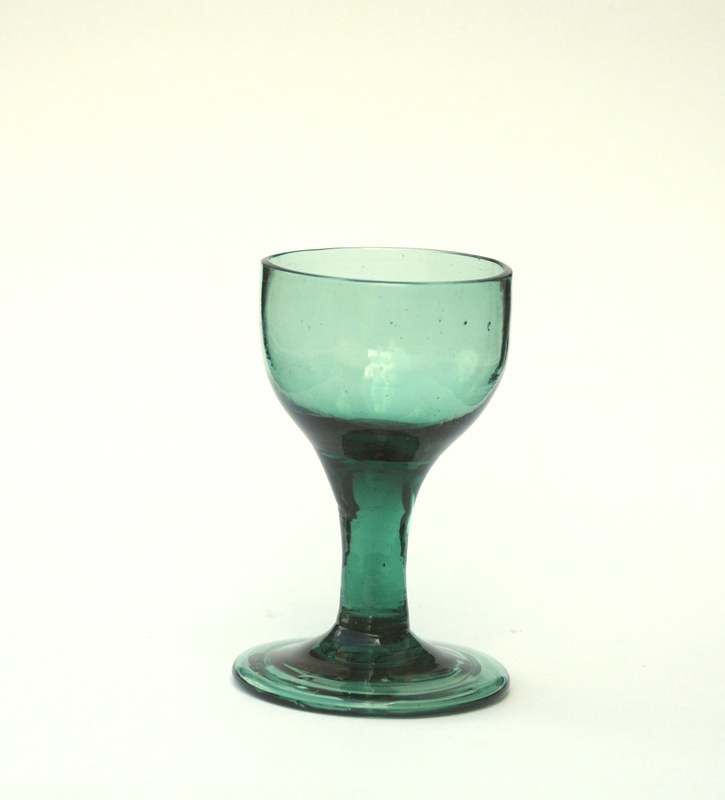 82E Green English wine glass with blown hollow stem and dome foot. This is a beautiful small amethyst pitcher having an optically molded body and perfectly laid on delicate thin handle. Green English wine with blown hollow stem and dome foot. 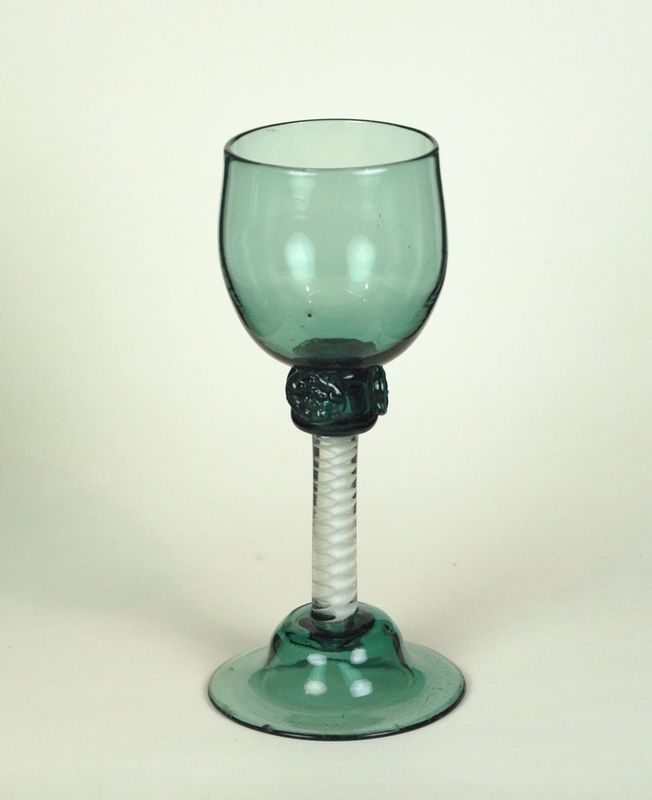 Remark: This green wine has a cup-shaped bowl, set on knop with three raspberry prunts, above a clear stem enclosing a double-series opaque-twist and domed foot. 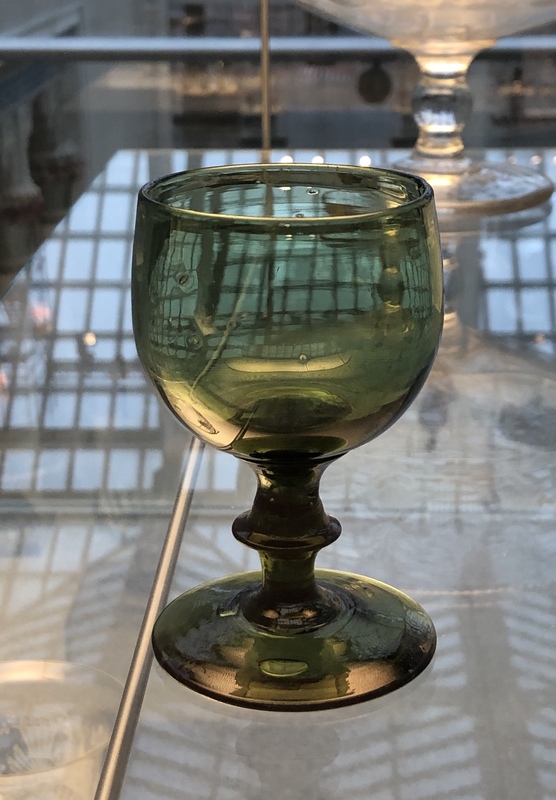 Remark: This green wine has a cup-shaped bowl, set on a knop with three raspberry prunts, above a clear glass stem enclosing a double-series opaque-twist and domed foot.